In 2001, Rockin’ Rider saddled up and set off towards a new frontier in rocking horse toys. The tradition might be old but we made it new again by incorporating modern technology to bring interactive features and enjoyment to children from all over the world. We pride ourselves in our snuggly soft horses and their ability to engage with children’s imaginations. Our Rockin’ Riders can handle the lightest of trots to the toughest trails; the goal is to create memories for your family while giving your little one a friend they can grow up with. Your child will love taking care of their new friend, encouraging brushing and grooming skills as well as learning the value of animal care. This all starts with how children interact with our horses. 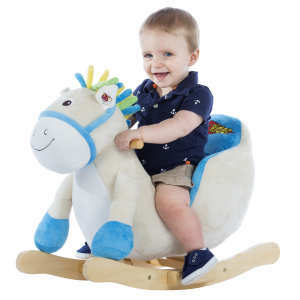 From moving mouths to touch-sensitive features; Rockin’ Rider horses break through the ordinary to bring an extraordinarily fun experience to your child’s play time. While our horses connect intellectually, they also help strengthen muscles and develop motor skills as they play. Good for the body and the mind, all wrapped up in a toy that will look great in any home. 2017 – Candy 2-in-1 Pony chosen as one of the Toy Insider’s Hottest Toys of the holiday season! 2017 – Vintage Rocking Horses awarded the Toy Insider’s Top Holidays Toys award! 2017 – Baby Rockers awarded the Toy Insider’s Top Holidays Toys award! 2016 – Henley Rocking Horse chosen as one of the Toy Insider’s Hottest Toys of the holiday season! 2016 – Holly Rocking Horse chosen as one of the Toy Insider’s Hottest Toys of the holiday season! 2015 – Tickles Baby Rocker chosen as one of the Toy Insider’s top toys of the holiday season! 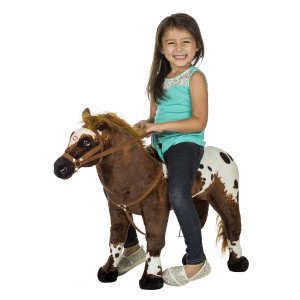 2015 – Domino Stable Horse chosen as one of the Toy Insider’s top toys of the holiday season! 2014 – Patriot Rocking Horse chosen as one of the Toy Insider’s Hottest Toys of the holiday season! 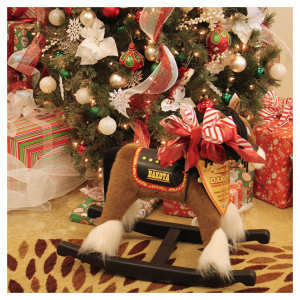 2014 – Patriot Rocking Horse chosen as one of 17 Hottest Holiday Toys on Grandparents.com! 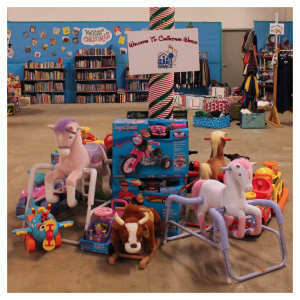 Rockin’ Rider regularly donates surplus and unused toys to those in need, partnering each year with G.R.A.C.E., a local, non-profit charitable organization which provides assistance to low-income families and those in need.